Call: Alison Paul on 0424588411. Email: Alison Paul at info@madewithlovemarkets.com. Come along to the Made with Love market where everything is made locally and handmade. 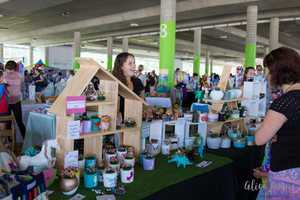 Around 100 stallholders with a great variety. Held four times per year. Find everything from upcycled garden scupltures to cupcakes, artwork to candles, handbags to soaps, dogcoats to bliss balls and heaps more! Lvl 1 Carpark, Park Beach Plaza.